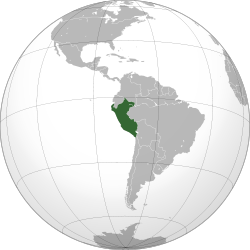 She çheer ayns America Yiass ee yn Pheroo (Spaainish: Perú, Quechua: Perú, Aymarish: Piruw). T'ee çhemmit liorish Ecuador as y Cholombey da'n twoaie, y Vrasseel da'n shiar, y Volivia da'n shiar yiass, liorish y Çhillee da'n jiass as liorish y Cheayn Sheealtagh da'n sheear. She Lima yn preeu-valley.